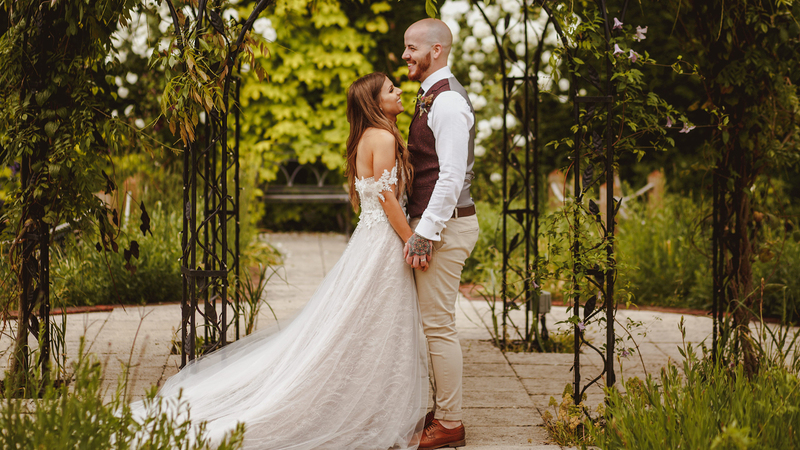 Over the last few years, rustic wedding styles have become increasingly popular and this makes us so happy as this style is perfect for a barn wedding. 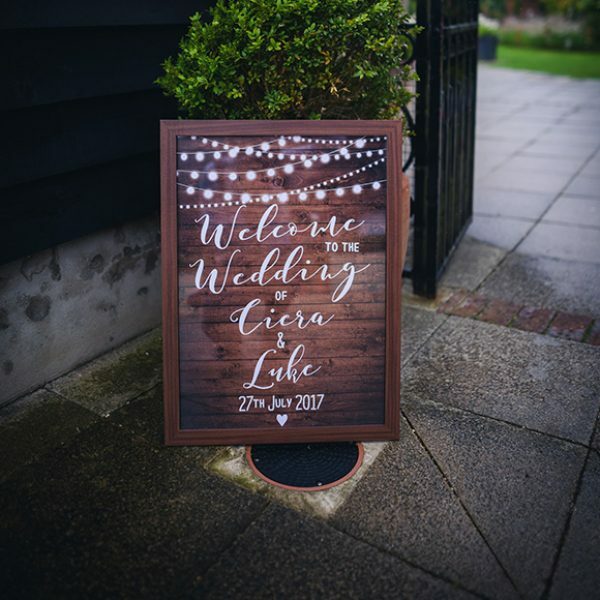 We LOVE seeing gorgeous rustic weddings here at Gaynes Park and we also love all the decorations and details that our couples include. Before we start, we should just take a moment to define ‘a rustic wedding’ and, quite simply, it’s one inspired by the natural world. Super bright colours, sequins and glitter and highly embellished, sparkly dresses don’t really work with this theme so keep everything as ‘real’ as possible. Firstly, think about natural colours and textures as a basis for your wedding. Wood, hessian and cotton contrast with lace and raw silks. Colour palettes have to include hues that you’d find in nature, particularly during the season you’re marrying in, alongside creams and neutral tones. There are lots of natural motifs, patterns and details and this is very much an organic style that should feel relaxed and authentic with an abundance of rustic beauty. 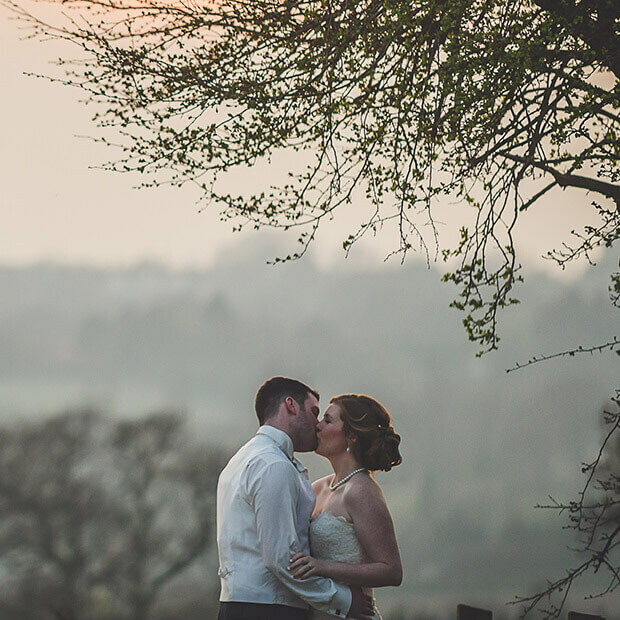 If you’re dreaming of a gorgeous rustic wedding, then Gaynes Park is the venue for you. 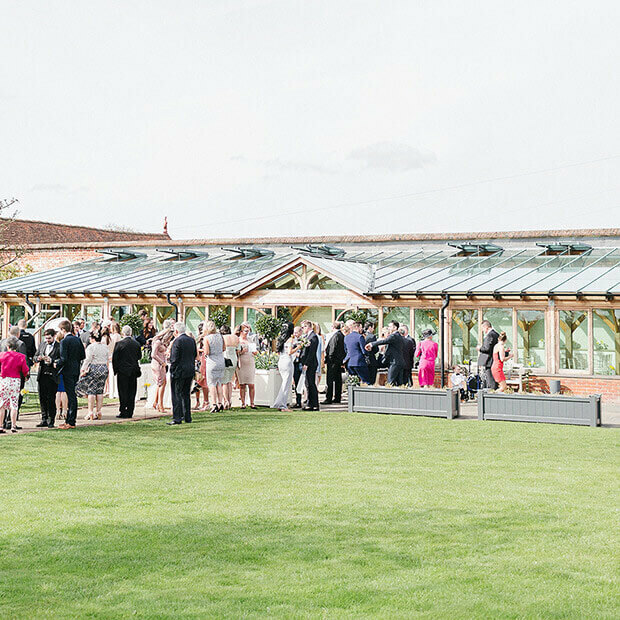 With the elegant Orangery set within the stunning Walled Garden, the adorable Gather Barn and the memorable Mill Barn, you couldn’t find a more perfect backdrop. 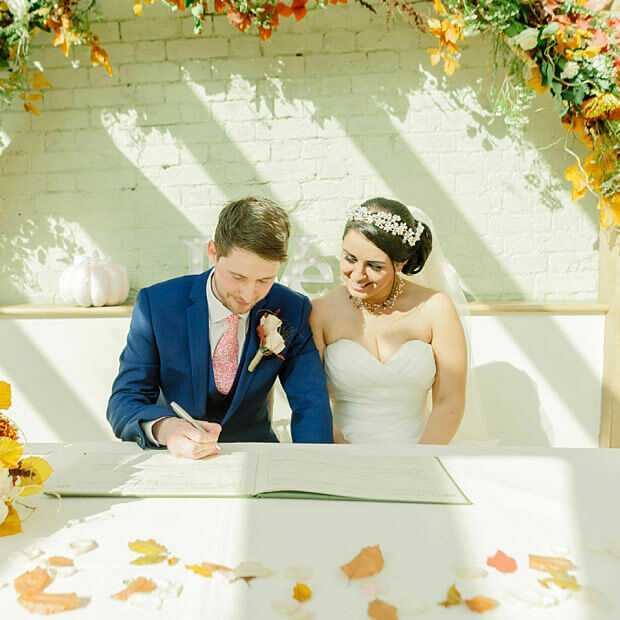 Once you’ve secured your wedding date, you can enjoy personalising and decorating the space to create your rustic wedding day. Any rustic wedding absolutely must include wood and there are so many ways that you can do this. 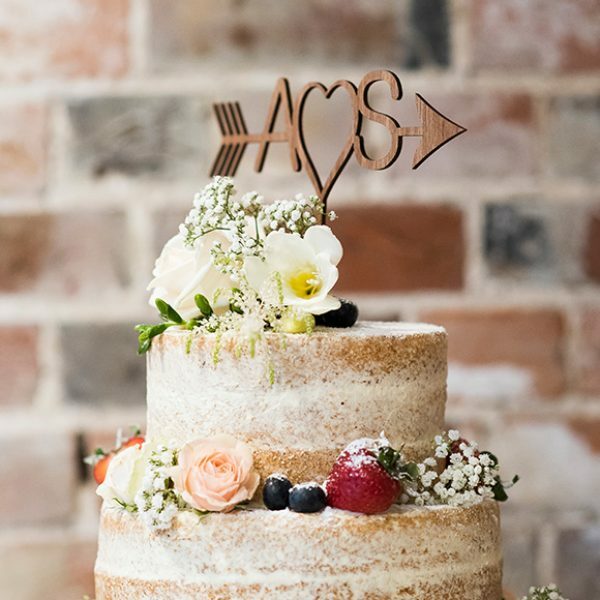 How about a personalised wooden cake topper as the perfect decoration for your wedding cake? 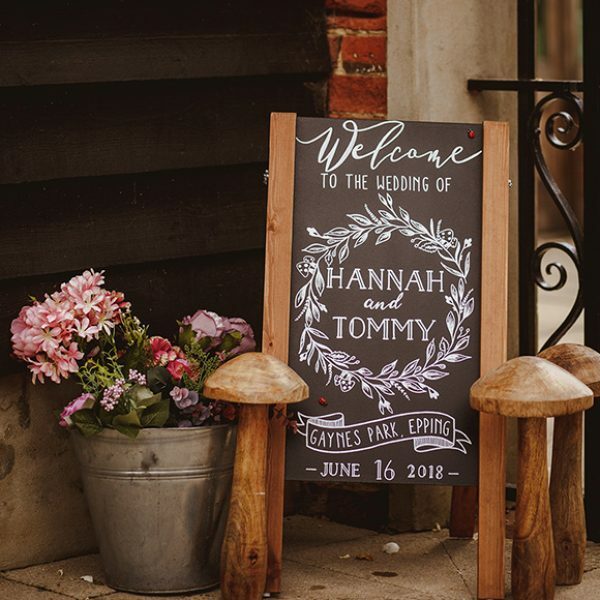 Or you could set out a gorgeous wooden welcome sign for your guests. If you can source the wood yourself, these are a fun wedding DIY and you’ll find easy-to-follow instructions online along with templates that you can download to guarantee flawless handwriting! Wooden details also look fantastic on your tables too. 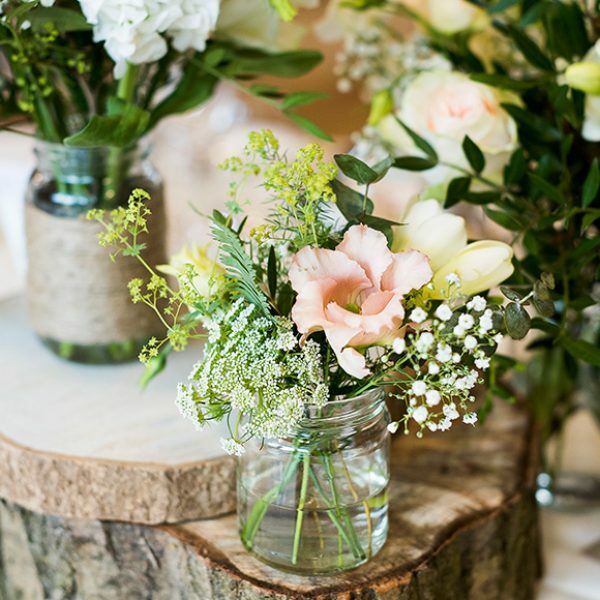 You can use wooden slices as part of your centrepieces – stand your flowers on these to give some height and interest or you could even create your own wooden table centres. Logs or stumps with moss and other woodland inspired details look so effective! For your wedding flowers, embrace seasonal blooms and a ‘just picked’ style. Hang flowers from the ceilings, wrap beams with foliage, use moss on your tables and place a sprig your favourite herb or a single cut flower at each place setting. Finish buttonholes with a twist of twine and let ribbons trail loosely from your bouquet. When it comes to your stationery, keep it natural. Brown card and paper is perfect and looks super with modern calligraphy. 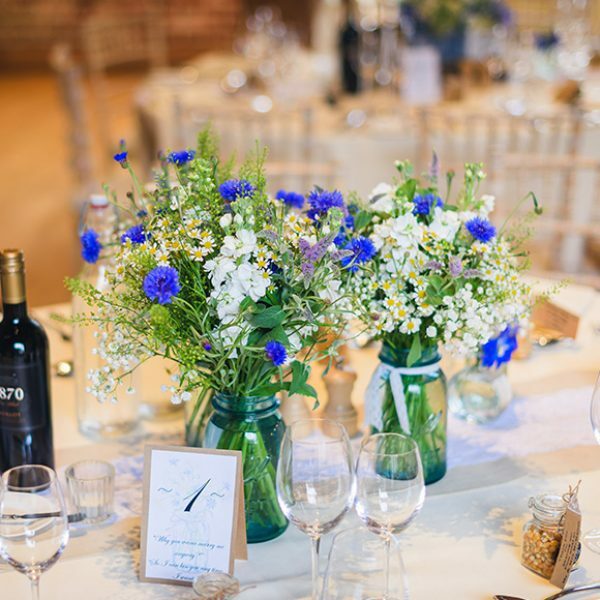 Alternatively, include hand drawn rustic motifs such as flowers and leaves on your stationery to give guests a hint of the style they should expect on the day. Your decorations really bring your theme to life so, if you can, include plenty of details, right across the venue. Here are some wedding ideas that you might like to add to your list: Real petal confetti is an absolute must-have. 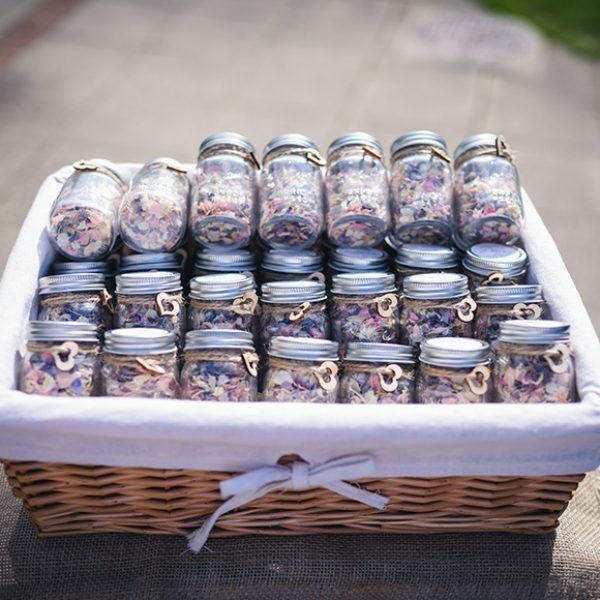 Let guests help themselves from a basket or crate or set out little jars, cones or packets for everyone to take before the confetti shot! An old ladder and some wooden crates make an excellent feature display. Add framed family photos, flowers, or even wooden letters that spell out your initials and you’ll have a brilliant focal point. Add fairylights in the evening for added sparkle! 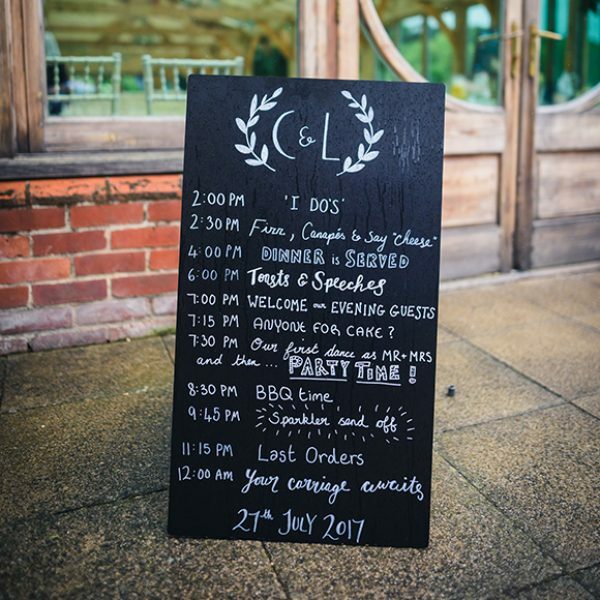 Guests always appreciate knowing the order of the day so why not write your running order on a chalkboard? Everyone will know just what’s happening so they can relax knowing that they won’t miss a thing! Vintage bikes are some of our favourite wedding props. 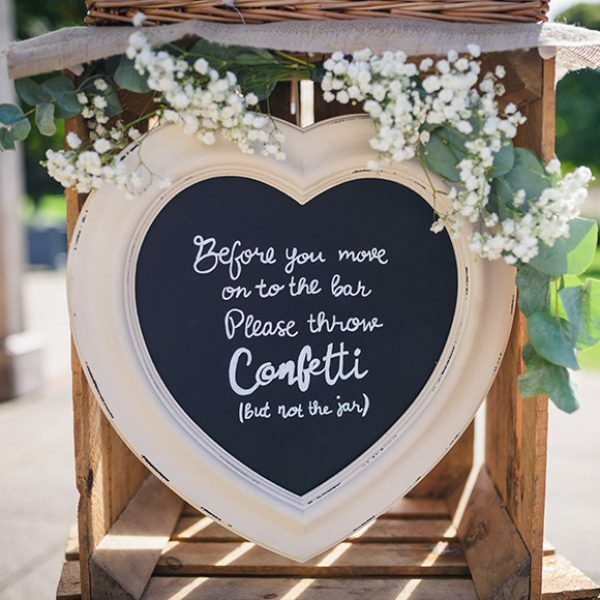 Fill the basket with flowers, add some bunting and you’ve got a perfect welcome decoration that can then be moved to the Mill Barn for your evening reception. Old suitcases are perfect for weddings and they’re incredibly useful! Guests can drop cards and gifts into them, they can hold confetti and you can even turn them into table plans! 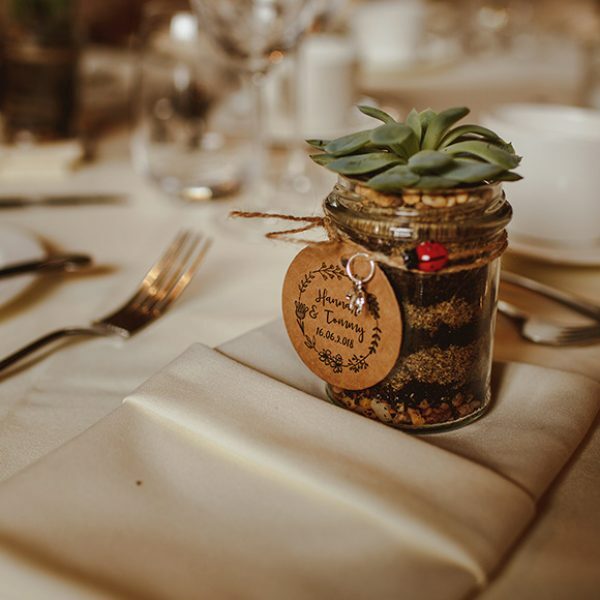 Make sure that your wedding favours have a flavour of the countryside too. 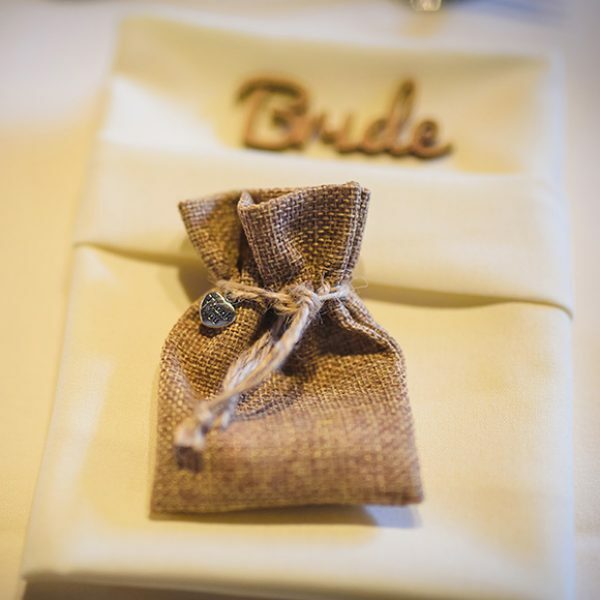 Small jars of honey or jam make ideal gifts for guests or why not tuck your favours into hessian bags – you could even stamp your guests’ names onto them or add a small tag so they double as place cards too. 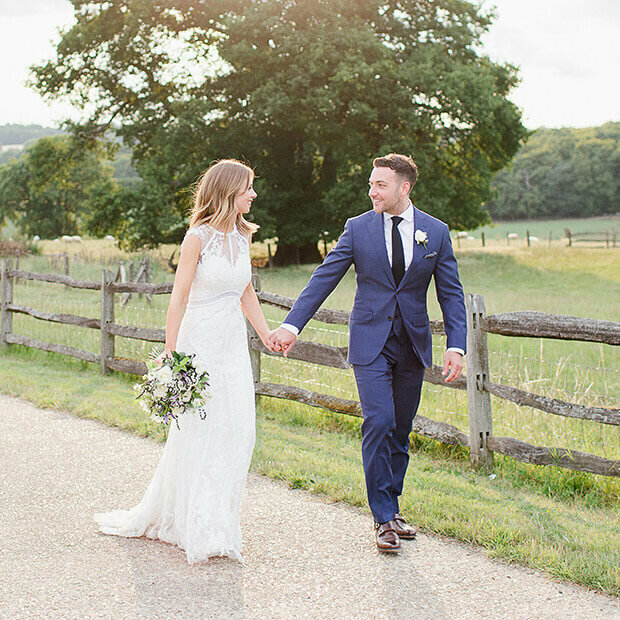 For more inspiration and to see some of the glorious real weddings that have taken place here at Gaynes Park, just browse through our blog or follow us on Instagram and Facebook.